Boxgrove Priory was founded in the early 12th century, when Robert de Haye, Lord of Halnaker, left the church at Boxgrove to the Lessay abbey in Normandy. The Benedictine Community here peaked at 19 monks in 1230. 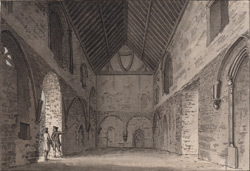 After Henry VIII's dissolution of monasteries in the 1530s, the buildings fell into ruin, with a survey of 1570 recording their use as a brewhouse, barn and stables. This hall, which dates from the 14th century, was the priory guest house and was originally two storeys tall. The hall has been reroofed as it was probably being used as a barn at this time.